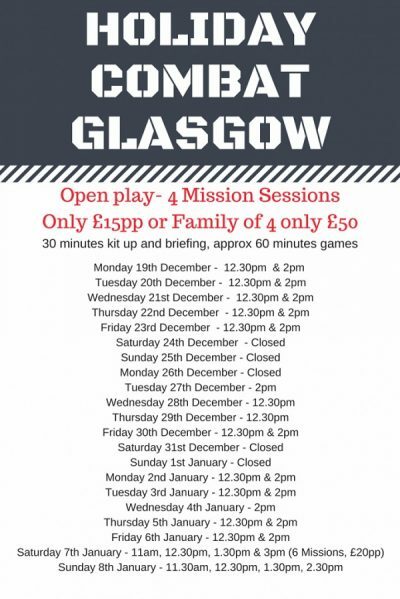 Glasgow tactical laser tag festive opening times at Combat City. Looking for some action packed family fun to burn off the turkey over Christmas? Have a blast at Scotland’s largest indoor laser tag arena, suitable for all ages from 7 upwards. We are open most days over the Christmas school holidays from 12 Noon, for open play sessions. After registering and a safety briefing you will be issued with your taggers. Your party will experience at least 4 tactical team based missions within the hour. It’s only £15pp, or families of 4 can save £10 with a £50 family pass (must include at least one parent). Call the recruitment line on 0141 641 0222 to book. PS Why not make a day of it by booking indoor go kart racing at ScotKart which shares the same facilities?